I received the box of Valentines and gave them out to the children this morning. They were quite pleased with them. Some of them organized a Valentine Party at once. Thank you and the children of your Primary Department very much for your Thoughtfullness. This entry was posted in Foster, Genealogy, Yegerlehner and tagged genealogy, Gladys R. (Foster) Yegerlehner, Indiana, Indiana Methodist Children's Home, Lebanon on July 28, 2016 by Deborah Sweeney. 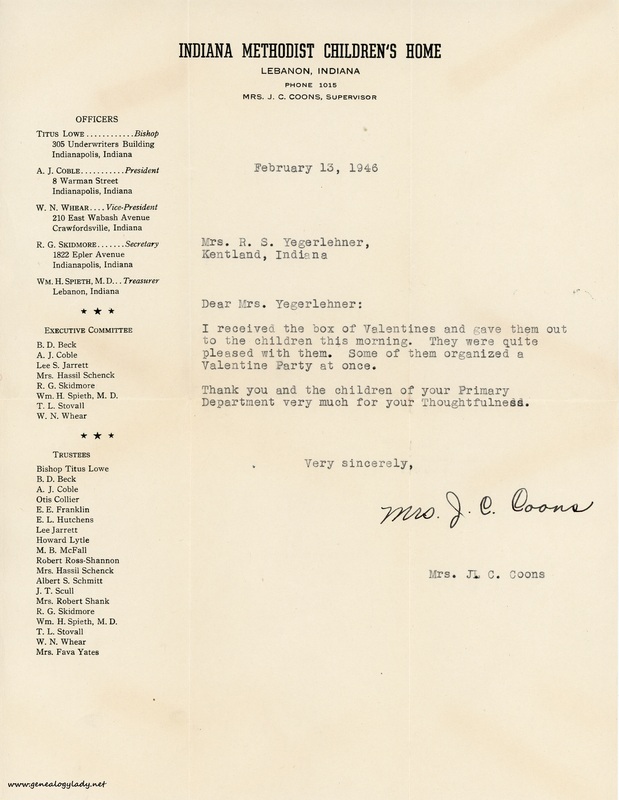 “Some of them organized a Valentine Party at once.” Cool. “Lebanon, Indiana Phone 1015” In Kentland, our home number was 322, and the doctor’s office was 323. Simple as that!